The cut of a diamond refers to the angles and proportions of the stone and has nothing to do with its shape. Diamond cuts are designed to ensure the proper reflection of light in the stone. This brilliance is known as the diamond's "fire." On the other hand, diamond cuts that are too deep or too shallow lose light through the sides and bottom, resulting in less brilliance and ultimately, a lower value. What Is a Good Diamond Cut? The safest way to determine good diamond cuts is by referring to the grading reports or certificates (jewelers call them 'certs') issued by reputable organizations. American Gemological Society (AGS), International Gemological Institute (IGI), and the Gemological Institute of America (GIA) provide these grading reports. A good table cut should be from 53% - 64% of the stone's girdle and good depth should be from 58% - 64%. Beyond these ranges the diamond is either too shallow or too deep and will not be as valuable. The exact specifications for different stones vary according to the number of desired facets and the overall shape. There are two general types of diamond cuts, and when combined, they can be manipulated into a number of shapes. Step cuts are simple incisions into the stone that create a series of steps along its surface. The most common stone shape created with step cuts is the emerald, or rectangular, shape. These stones have an elegant simplicity reminiscent of vintage and antique rings, and while they do not sparkle as much as other shapes, the elongated surface of the stone presents a regal appearance. 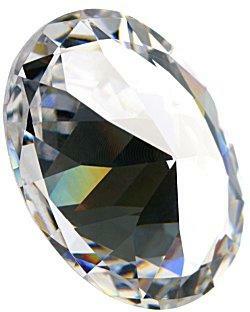 Brilliant cuts are intended to maximize the facets in the stone at the ideal angles for internal refraction, resulting in the brightest diamond fire. The standard shape for brilliant cut diamonds is the classic round which is the most common cut of diamond. Found in engagement rings, bridal sets, wedding bands, earrings, bracelets, and other pieces of jewelry, brilliant cut diamonds are versatile as well as popular. Mixed-cut stones are any other shape that is formed from both step and brilliant cuts. For many stones, step cuts are easier to create, but flaws and other defects are more visible. Brilliant cuts are included to increase the sparkle and diminish the appearance of such defects, increasing the diamond's appeal. Trillium, princess, and heart diamonds may all be mixed-cut stones depending on how the raw diamond is worked. A diamond's cut is one of the main factors affecting its value, including initial price and the appreciation rate of the stone. By being knowledgeable about diamond cuts, buyers are able to determine the best value stone for their budget and can purchase an engagement ring that will be as gorgeous on the couple's fiftieth anniversary as it was when the proposal was accepted.